Today, I accompanied Mary on a quick trip to the Uptown Theater for a nest check. I can’t quite express how excited I get when we go up there as I’ve fallen head over heels for that building! It’s such an honor to be able to spend even a little bit of time inside. Dave, the caretaker, was standing outside the front entrance waiting for us when we pulled up. I haven’t been up that way since last year and I have to say, the block has undergone some changes. It looked somehow spiffed up a bit and I noticed a few new businesses on either side of the theater. I hope that bodes well for the continued effort to restore the theater to its former glory! Unfortunately, we all but ran through the theater on the way to the falcons, as both Mary and Dave had time constraints. When we reached the door to the fire escape, I was a bit out of breath but managed to do a quick lens change in the near-dark without dropping anything. Mary put a helmet on and Dave opened the door to the ledge. I stepped out behind Mary and began shooting, hoping to catch the leg band numbers of the adults before they could take off. 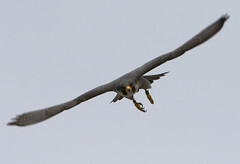 The Uptown adults have always been a bit on the aggressive side and the nesting site really provides them with a nice, clear patch of sky from which to attack, which is good – not necessarily for our group, but good that the parents chose a spot that they could so easily defend. Both adults were in the sky before Mary had reached the fourth step and they took turns diving towards her as she tried to crouch-run upwards. For my part, I tried to keep the darting birds in view and in focus while ducking when they dove my way, which was not as easy as it sounds. In no more than two minutes, Mary was back down by my side. 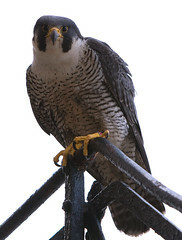 The female landed on the railing about fifteen feet away from me, giving us a fierce look as she guarded the stairs in case anyone else tried to go up to the nest. I kept shooting as Mary filled Dave and I in. Fifteen minutes after we’d arrived, we were on our way back down. I have to admit, I was a bit nervous that all of my pictures would be shots of the empty sky or a streaking blur, but I had to wait to check unless I wanted to break my neck descending the many flights of dark stairs. I had a chance to look on the drive back down to the museum and was pleased to find about 40 of my 70 shots were usable. As I’d suspected, I had my fair share of shots with blank sky and maybe the blurred blob of a tail in bottom two inches of the frame, but I did have one or two passable flight shots and a number of crystal clear shots of Zoom (b/r *4/H bands crystal clear) on the railing. Tonight, I’ve had more time to look at the pictures. I’ve said it before and I’ll say it again, I really, really wish that photo enhancer they use on CSI actually existed, because I could have had those band number in about two minutes. I had a few shots of the male, but the bands were very hard to read. After considerable time photoshopping, I managed to enhance the bands enough that I could read them. I asked Sean to come in and see what he could see. He read the bands pretty quickly, so I feel safe in reporting the adult male of the last 6 years has returned to Uptown (b/g, G/G). ~ by Steph on May 6, 2009.